April 4th sees the theatrical release of Michael Haneke's own personal remake of his 1997 classic Funny Games with Naomi Watts and Tim Roth, and to say we're excited would be an understatement. To celebrate the release of the film, Tartan have kindly given us three copies of one of their best titles in their back catalogue, namely Brian Yuzna's Society, which the eagle-eyed amongst you will have spotted, was the first film shown at the Curzon Soho to launch their great new season of Midnight Movies. To stand a chance of winning one of these three DVDs, simply scroll to the bottom of the page, answer the easy question, enter your name and email address and press submit. 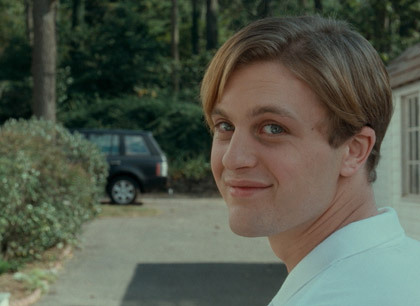 A literal shot-for-shot remake of his own acclaimed 1997 film, Funny Games is Haneke's attempt to bring his hard-hitting moral messages to a wider mainstream audience. Michael Haneke - "When I first envisioned FUNNY GAMES in the middle of the 90s, it was my intention to have an American audience watch the movie. It is a reaction to a certain American Cinema, its violence, its naiveté, the way American Cinema toys with human beings. In many American films violence is made consumable. However, because it was a foreign language film and because the actors were not familiar to a US audience, it did not reach its audience." The vacation begins with Anna, George and their son Georgie on their way to their summer home. The neighbors, Fred and Eva, are already there. They make a date to play golf the next morning. It’s a perfect day. Anna begins to make dinner, while her husband and son are busy with the newly renovated sailboat. Suddenly, Anna finds herself face to face with a polite young man, the neighbors’ guest Peter, who has come to ask for some eggs because Eva has run out. Anna is about to give Peter the eggs, but hesitates. How did he get onto their property? Peter explains that there’s a hole in the fence – Fred showed it to him. Things seem strange from the beginning. Soon, violence erupts. 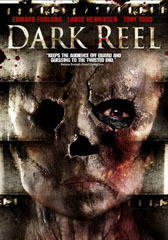 The thriller follows the rules of its genre, providing the deliverance that allows the audience to feel comfortable watching the film. 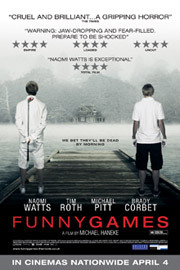 Funny Games US is released in UK cinemas on April 4th 2008. For more information, visit the website at www.funnygamesthemovie.co.uk. Download 'William Tell' Clip here (Quicktime). Download 'Charming' Clip here (Quicktime). What was the name of the previous film directed by Michael Haneke?